With all the press interest in superfast and ultrafast broadband technologies, it is easy to understand the frustrations for consumers and businesses that only have access to basic ADSL services with low speeds. Despite the rapid roll-out of superfast fixed broadband services, the Department of Culture, Media and Sport (DCMS) estimates that about 1 million premises will still not be able to access a fixed broadband service offering a download speed of 10 Mbps or above by 2017. As described in our Increase Broadband Speed guide, there are a number of useful enhancements that can be applied to a single low-speed ADSL broadband connection. However, in the absence of fibre broadband, options are extremely limited for substantially increasing broadband speeds. Some business located in areas not enabled with fibre broadband have opted for bonded ADSL solutions, which combine two or more ADSL connections together. For example, bonding two or three ADSL connections together (each capable of a download speed of 2 Mbps) can deliver download speeds of roughly 4 Mbps and 6 Mbps. We have been impressed with bonded ADSL broadband solutions that we have previously tested from Sharedband and Evolving Networks. However, with the need for two or more phone lines and a significant monthly subscription, costs of bonded ADSL can be substantially higher than a single consumer broadband connection, making such services more suited to businesses than consumers. Building on the development of business bonded broadband solutions by Sharedband, Boosty has become the first bonded broadband provider to target the consumer market with an innovative solution using smartphones. We hope that this marks the start of a range of affordable consumer bonding solutions becoming available in the UK. The new product, which is called Boosty, bonds a single ADSL connection with a mobile broadband connection via a smartphone. This means that a second ADSL connection is not required, with the service making use of the 4G or 3G mobile data connection that many consumers already have on their smartphone. Over two thirds of people in the UK now own a smartphone according to Ofcom, with many smartphone tariffs offering a 3G or 4G mobile data allowance that could be used by the Boosty service. Mobile operators offer a range of mobile data options, with a monthly data allowance typically up to about 20 GB per month. 3 also offers options with unlimited monthly data allowances. Following years of relatively poor investment in 3G networks, mobile operators are embracing the opportunities with high-speed 4G (LTE) services. Mobile operators are currently in the process of rapidly rolling out their 4G networks, and were aiming to achieve 98% UK population coverage by the end of 2015. In contrast, fixed superfast broadband services reached only 90% of UK premises in April 2016. This means that, in some areas, 4G networks can deliver much faster broadband speeds than fixed ADSL networks. In these areas, Boosty makes considerable sense. 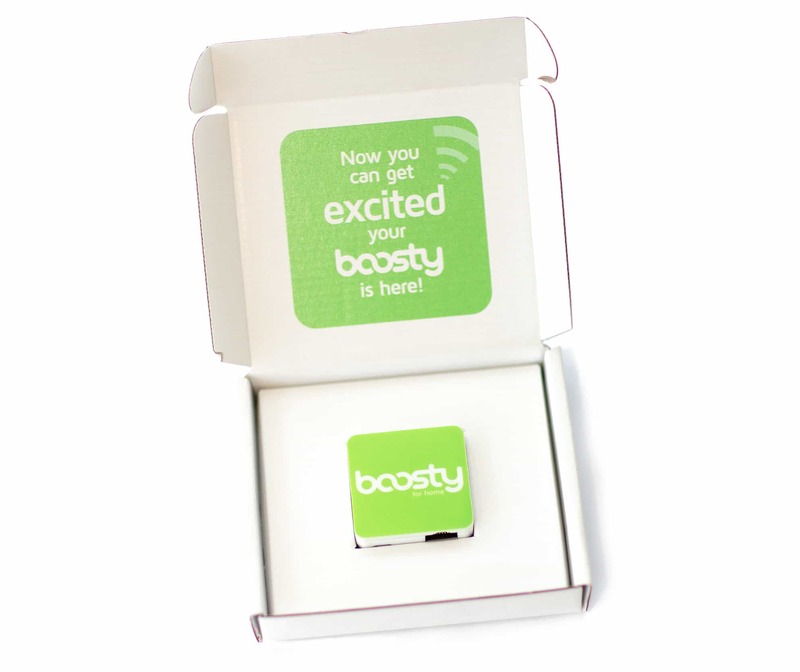 For consumers with an existing smartphone with an 4G or 3G monthly data allowance, Boosty is surprisingly affordable. The Boosty Starter Pack costs £69 and comes with a small Boosty router (described below) and 12 months of the bonded service included. This is the equivalent of £5.75 per month. After 12 months, a further 12-month subscription costs £39 – the equivalent of only £3.25 per month. A 30-day money back guarantee is also offered. Note that the Boosty router remains the property of Boosty so would need to be returned if the annual subscription is not renewed. To get the most out of Boosty, we recommend having an ample mobile data allowance on your smartphone, so you may need to factor in the cost of an upgrade (although some great offers are available currently). However, the total cost is likely to be substantially lower than the cost of an additional phone line and the monthly subscription for a bonded ADSL service. Furthermore, in locations with very low ADSL speeds, Boosty will deliver significantly higher speeds than a bonded ADSL service using two lines (as described below). a compatible smartphone running iOS (iOS 7.1.2 or higher) or Android (4.1.2 or higher) with good indoor 4G or 3G reception. The service comes with a tiny Boosty router (shown below), with dimensions of only 4.4 cm x 4.4 cm x 1.4 cm. On the side of the router is an Ethernet port. A short Ethernet cable is provided to connect the Boosty router to a free Ethernet LAN port on the main router (for example, a BT Home Hub). For the purposes of our trial, a BT Home Hub 4 was provided, and we were not able to test the service with other routers. We are assured that Boosty should work with many types of router, but there is a 30-day money back guarantee so that you can check that your particular equipment works. The Boosty router also incorporates WiFi with an internal antenna. This allows a connection to be made to a smartphone (using the BoostyLink app). The Boosty service works in a similar way to bonded ADSL as described in our bonded ADSL information page. However, rather than using multiple ADSL connections, it uses a single ADSL broadband connection and a mobile broadband connection. Once the Boosty router gains control of the ADSL and mobile broadband connections as part of its automated set-up process, it can smartly combine and separate the traffic carried on the two connections to maximise overall throughputs. We found the service easy to set up, helped by a clear set-up guide. All we had to do was connect the Boosty router to the BT Home Hub using the supplied Ethernet cable. A green light on the Boosty router indicated that it was ready for use. 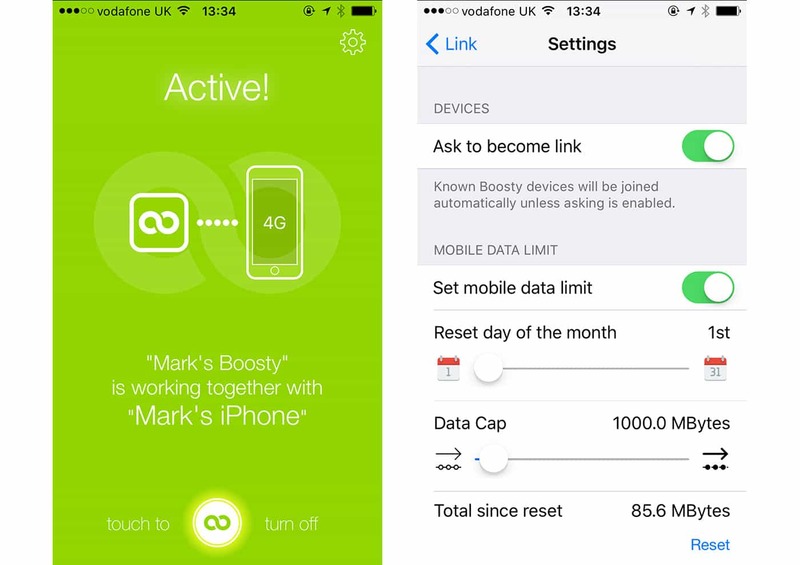 We then installed the BoostyLink application on our iPhone 6s Plus. We then opened a web browser and went to myboosty.com to activate our Boosty account. One area where a great deal of thought has clearly been placed is control of mobile broadband usage. This will particularly appeal to users who have relatively modest mobile data allocations so wish to allocate their data allowances in a targeted way. The service always aims to use the ADSL connection first and foremost. So, if traffic demands are light, only the ADSL connection will be used. It is only when additional speed is useful that the mobile broadband connection will be used. Essentially, the mobile connection is being used as a speed booster. In its default configuration, Boosty gradually increases the amount of mobile data used when the ADSL broadband connection is full. There is also a 'turbo' feature that can be selected to provide more immediate speed boosts (albeit with increased use of mobile data). We were impressed with the ability to monitor the performance of the Boosty service, as well as control aspects of the service, by going to myboosty.com using a browser. There is a real-time view of the individual download speeds from the ADSL connection and the mobile connection, as well as the overall download speed from bonding the two connections together. We really liked the access control options. The application listed all the available devices on the network and we could choose which ones were permitted to use the bonded connection (using mobile access). The unticked devices would just use the standard ADSL connection. So, a user could simply pick a particular device (say a work PC) to boost, to minimise mobile usage. The BoostyLink mobile app also provides additional control. In its 'Settings' options, it provides the option to set a mobile data limit. If this is selected, a monthly data cap (for example, 1 000 MB) can be entered as well as the day of the month that the data allowance is reset. This is a very nice feature to those who are worried about exceeding their mobile data allowance. While all the mobile data minimisation controls are very useful, we would recommend users to seek out mobile deals with high or unlimited mobile data allowances to get the most from the Boosty service. The speed boosts achieved become quite addictive! Boosty is claimed to work on ADSL broadband lines with a download speed of 12 Mbps and below, and offers a total bonded speed of up to 16 Mbps. Based on these numbers, there would be little point in using the device if your ADSL broadband connection delivers a speed of nearly 12 Mbps as the speed boost would not be particularly noticeable. However, the service should make a substantial difference for those suffering with ADSL broadband download speeds below 10 Mbps. To test the Boosty service, we were provided with a speed limiter box to limit the speed of our fixed broadband connection to 2 Mbps, which is representative of many users with poor ADSL broadband connections. The screen shot below shows the speeds we achieved through the combination of an ADSL connection and an iPhone 6s Plus connected to Vodafone’s 4G network. As you can see, we achieved an overall download speed of over 15 Mbps. Performance was excellent and browsing was very responsive. The experience was certainly much better than the 2 Mbps ADSL connection on its own. Obviously, overall performance will be highly dependent on the quality of the mobile broadband connection as any bonded service is only as good as the individual broadband connections being used. Testing of latency revealed pings on the bonded connection that varied between 25 ms and 126 ms, which reflected the raw performance of our mobile broadband connection. Inevitably, fibre broadband is generally able to achieve lower and more consistent pings than a mobile broadband connection. However, for those unable to get fibre broadband, the level of performance was very good, and far superior to a very slow ADSL connection. For business users who suffer from poor ADSL broadband speeds (for example, 2 Mbps or below), the Boosty even makes a good case for itself compared with more expensive bonded ADSL solutions. With our 2 Mbps ADSL connection, we were able to achieve 15 Mbps download speed overall, which is over seven times faster than the ADSL connection. Bonded ADSL using eight individual phones lines would have been necessary to achieve similar download speed performance - an extremely expensive proposition. Why not opt for for a mobile broadband-only solution? One obvious question that came to mind when reviewing Boosty, is why not just opt for a mobile-only connection for broadband? We could imagine some consumers just opting to use mobile broadband alone, particularly if ADSL speeds are very low. As an example, EE offers its Osprey 2 mini 4G WiFi router that supports up to ten devices, and provides 50 GB of inclusive data per month at a monthly cost of £30. However, Boosty offers major advantages over a standalone mobile broadband connection in terms of cost, mobile usage control and resilience. By utilising an ADSL connection (where unlimited usage tariffs are common), mobile broadband costs and usage can be minimised. Heavy Internet users may find the usage allowances of mobile-only broadband packages too restrictive. 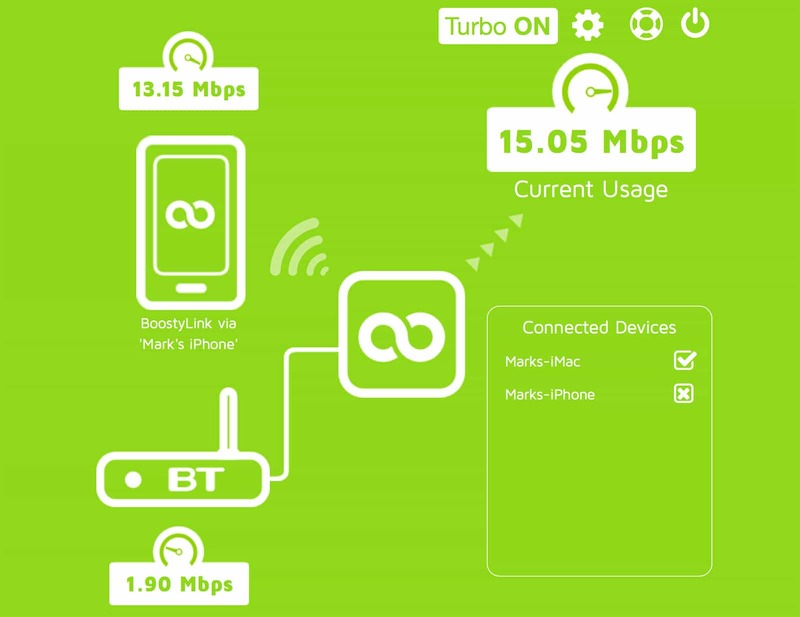 The Boosty service allows careful control of the mobile broadband connection, so that traffic carried on the ADSL connection can be maximised while providing speed improvements when required. As with other bonding services, Boosty continues to provide a broadband connection when either of the connections goes down, and we confirmed that this was the case. This feature will be particularly valued by small business owners or people working from home. The expansion of bonded broadband solutions into the consumer space is a very welcome development. 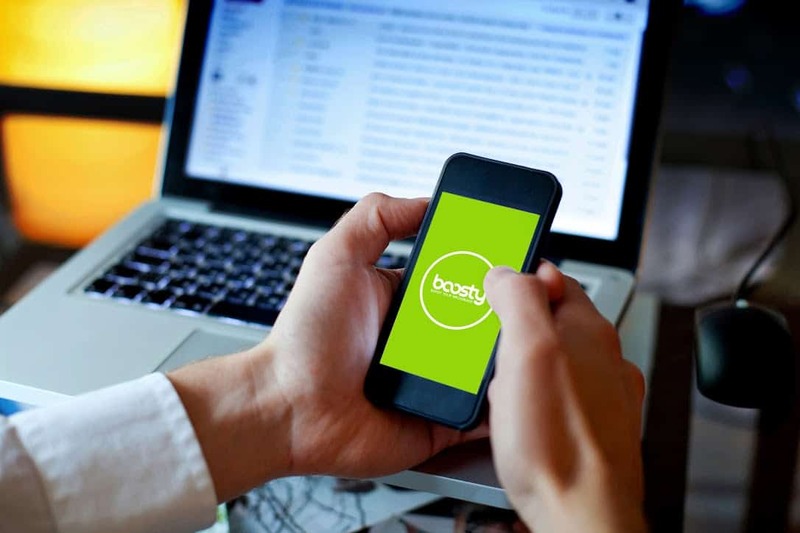 Being the first of its kind, Boosty is impressive in terms of its performance and pricing, and is sure to attract interest from consumers struggling with low ADSL broadband speeds but in areas with good 4G or 3G mobile coverage. The rapid roll-out of 4G mobile services will only enhance the appeal of Boosty further. In areas where 4G mobile speeds are much faster than ADSL broadband can provide, Boosty may even attract some business users away from more expensive bonded ADSL solutions due to the higher speeds that may be achieved.